Sewing is an indispensable skill if you want to become more resourceful, enabling you to fix a button, mend a split seam, or even make your own clothes. This book starts with the basics, such as choosing your equipment and fabrics, before proceeding to guide you through a range of sewing projects, each of them accompanied by step-by-step illustrations and straightforward instructions. Budding stitchers will find themselves turning to these pages time and time again to help them master the essentials of this rewarding craft. The Anyone Can series has been created with the absolute beginner in mind as well as those who would welcome a refresher in the most popular needlecrafts. Charlotte Gerlings was born in Reading, Berkshire. She graduated in publishing from Oxford Polytechnic (now Oxford Brookes University) and since then has worked as a book designer, writer, and editor. She lives in South West London and is currently studying at Wimbledon School of Art for her MA in fine art. 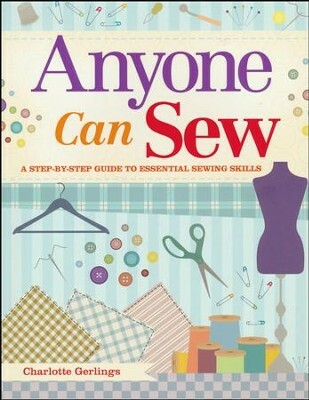 I'm the author/artist and I want to review Anyone Can Sew, A Beginner's Step-by-Step Guide to Sewing Skills.